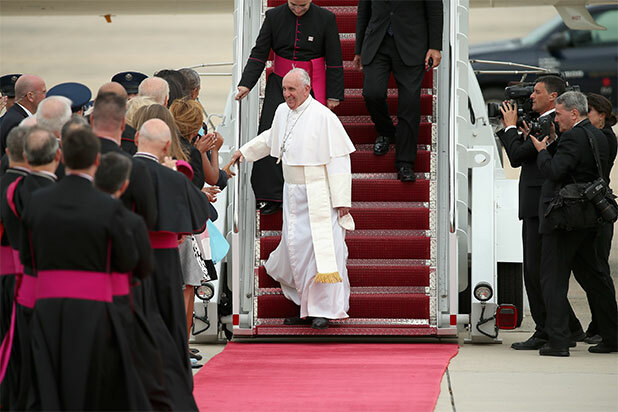 Pope Francis arrives at Joint Base Andrews, Maryland from Cuba on Sept. 22, 2015. President Barack Obama, the First Lady and their daughters welcome Pope Francis, during his first visit to the U.S. on Sept. 22, 2015. Pope Francis is greeted by a group of Catholic school children on Sept. 22, 2015. Pope Francis waves to crowds from the back of his Fiat after arriving from Cuba on Sept. 22, 2015. President Obama and Pope Francis shake hands during the arrival ceremony at the White House on Sept. 23, 2015. Pope Francis and President Obama stand for the U.S. National Anthem during the White House arrival ceremony on Sept. 23, 2015. The Pontiff, President and Mrs. Obama wave to crowds outside the White House on Sept. 23, 2015. Pope Francis and President Obama review the U.S. Army's Old Guard Fife and Drum Corps during the arrival ceremony at the White House on Sept. 23, 2015. Pope Francis gives a speech during his arrival ceremony at the White House on Sept. 23, 2015. President Obama and Pope Francis have a meeting in the Oval Office of the White House on Sept. 23, 2015. Pope Francis rides in his specially-made Jeep popemobile during a parade on Sept. 23, 2015. Spectators gather on the streets of Washington, D.C. to catch a glimpse of Pope Francis. The Pope kisses a little girl, after she broke through a security barricade on Sept. 23, 2015. The Pope leads a canonization Mass for Junipero Serra on Sept. 23, 2015. The Pontiff closes the canonization Mass with Washington Cardinal Donald Wuerl. The Pope waves to a crowd from the balcony of the U.S. Capitol on Sept. 24, 2015. The Pope greets members of Congress just before giving a speech on Sept. 24, 2015. Vice President Joe Biden and House Speaker John Boehner listen to an address by Pope Francis on Sept. 24, 2015. The Pope addresses a joint session of Congress on Sept. 24, 2015. Pope Francis meets with homeless, immigrant and low-income clients of Catholic Charities in Washington on Sept. 24, 2015. Pope Francis bids farewell to Secretary of State John Kerry before departing Washington on Sept, 24, 2015. Pope Francis leaves Washington via American Airlines en route to New York City on Sept. 24, 2015. Pope Francis makes his way down 5th Avenue in New York City towards St. Patrick's Cathedral on Sept. 24, 2015. Pope Francis is greeted by crowds in New York City on Sept. 24, 2015. The Pope acknowledges well-wishers outside St. Patrick's Cathedral as New York Gov. Andrew Cuomo and Sen. Chuck Schumer (D-NY) watch on Sept. 24, 2015. Protesters hold signs on Fifth Avenue before the arrival of Pope Francis at St. Patrick's Cathedral on Sept. 24, 2015. Police stand watch outside St. Patrick's Cathedral awaiting the arrival of Pope Francis on Sept. 24, 2015. Pope Francis pauses to pray during a visit to Ground Zero on Sept. 25, 2015. Pope Francis visits the Ground Zero Memorial Grounds on Sept. 25, 2015. Pope Francis delivers an address to the General Assembly of the United Nations on Sept. 25, 2015 in New York City. Thousands of people wait to go through security screening to enter Central Park where Pope Francis will ride in a motorcade on Sept. 25, 2015 in New York City. School children photograph Pope Francis after his arrival to the Lady Queen of Angels school on Sept. 25, 2015. Pope Francis greets school children upon his arrival to the Lady Queen of Angels school on Sept. 25, 2015 in the Harlem neighborhood. Thousands of people gathered to see Pope Francis ride through Central Park in the popemobile on Sept. 25, 2015.